Product recommendations can deliver a significant return on the investment when done right. 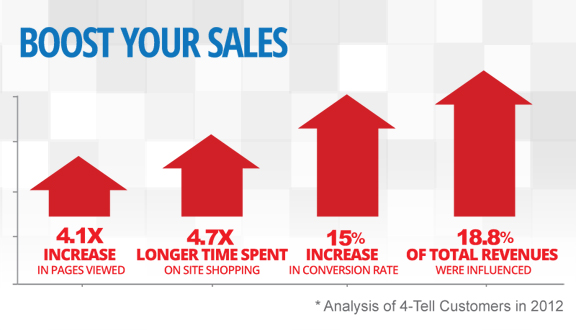 Our partner 4-Tell is an expert in this field, and their experience has shown that introducing personalized product recommendations in emails can provide a substantial increase in clicks and conversions. Read about it in the blog post that introduced the integration between MailUp and 4-Tell: "Grow sales with dynamic product recommendations in your emails". A MailUp account - Sign up for a free trial if you don't have one! A 4-Tell account - Contact 4-Tell and tell them you're a MailUp customer: you will receive 50% off the first month. An ecommerce store that can feed data both into MailUp and the 4-Tell system. If you are running a Magento-powered store, you are all set! If you need any help, please contact the 4-Tell team. They're happy to help. Just give the 4-Tell team a call and they'll help you get all set up! 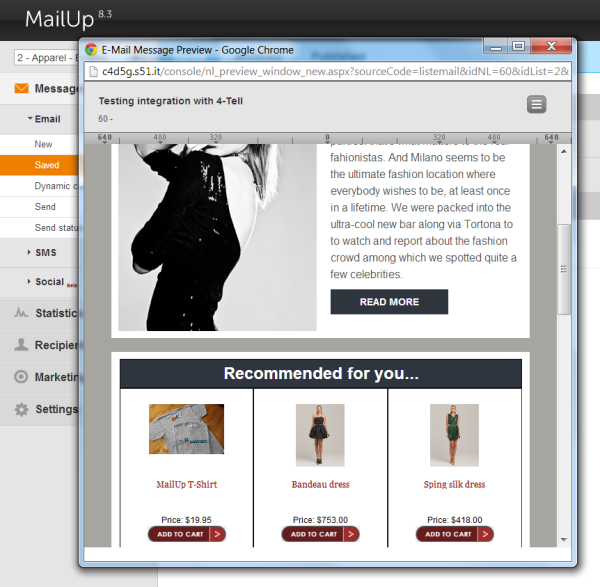 Here is an example of live, personalized product recommendations in a MailUp message built using one of MailUp's fashion templates. MailUp customers that sign up for the 4-Tell service can get 50% off the first month of service. So testing out whether it can really increase your sales can be very inexpensive!